I was having such a sad day yesterday. Just one of those days when the weight of the world comes pressing down, and the pressures of reality are all too...shall we say...real. I was also lamenting the fact that another one of my favorite magazines has bitten the dust. You've probably all heard by now that Mary Engelbreit's Home Companion is no more. I had heard the rumor. Then my card came. The card telling me that it had ceased publication. Sigh. Let us all now have a moment of silence for the demise of another lovely publication. Tick. tick. tick...etc. MEHC you will be missed. The quilt is spectacular! I wish you all could see the beautiful patterns in the stitching (forgive me because I'm not a quilter and I think there is another term for it). I promised the Hubby that I'd crop out his feet when I posted the pictures, but then I thought it was so cute that he humors me the way he does and was willing to hold up the quilt so I could get a photo of it for my readers. He even reminded me to take a photo of the back...which is lovely too! Sorry, honey...the feet are staying! Thanks again Camille and Lissa! You made my day! And a reminder again about the Taming Kid Clutter Linky Party next Wednesday, February 4th. Please come link up with your best ideas (or any ideas for that matter) on how to store, hide or camouflage kid paraphernalia! I can't wait to see what you all come up with! Funny how sometimes we just can't wait to share...even if the light would be better in the morning! Really beautiful quilts! Your new quilts are beautiful!! Quilting is on my list of skills to learn. Spectacular! As a quilter I truly appreciate the hard work. You are so lucky. Oh man, I am sorry you were having a blah day, but oh how fun that your quilts came in. They are so stunning! Congrats on winning the giveaway!!! Where are you going ot put your new quilts? I'm so glad you got a little "pick-me-up" tonight! Your quilt is beautiful! 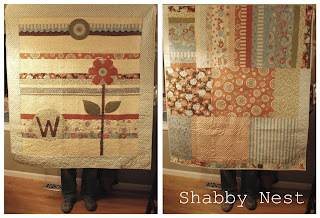 Love that quilt and I can only imagine it cheered your day! LUUUKYY... those are gorgeous! Enjoy finding a spot for them! You are the luckiest ever, I am no quilter and might not ever be, but if I was to pick out some fabric pieces, I could just hope that it would look like those. I so love your blog and look forward to reading it everyday. And very sad day to hear about MEHC.....HOW DEPRESSING!! Beautiful and so happy that it made your day!!! May you enjoy it for years to come! beautiful quilts. What size are they? oh those are GAW-JUS...girl! you lucky thing, you!! Those quilts are fabulous...the perfect pick me up indeed! Congratulations on the beautiful quilt! And it's even nicer that it came on a day when you needed a little pick-me-up. Enjoy! Hi Ladies! I think something about what I said was a bit confusing. It's one quilt (the photo is of the front and the back) and Kasey...it is "throw" size. About 60" or so. What? MEHC gone!? I was just hoping/waiting for my next issue?I'm just sick about the demise of MEHC (and Country Home too). What will we do without the incredible inspiration of such a great publication? By the way...love the quilt. Yes lucky you! That quilt is fantastic! I LOVE THAT QUILT! Hope you have a better day today. Maybe read a good book under your new quilt. Perfect day for your quilt to arrive.. it is beautiful! Lucky You! I received my card in the mail on Monday...sniff...sniff....but, I have never subscribed to Southern Living and I'm sure I will enjoy it. It is sad that so many of the great magazines are ceasing publication. P.S. I'll have to check Design Mom out - sounds neat! Wow. That quilt is beautiful!! I love the colors and patterns. that quilt is beautiful! Lucky Girl!! Glad your day was looking up... mine would too if I got those quilts in the mail. Pretty!!! Hey girl, beautiful quilt! I dropped off an award for you at my blog but it looks like you already have it! Come by and visit anyways! It's so very pretty. Gorgeous! I can't wait for your taming kid clutter linky party! I'm getting all ready for it. Hi, wanted to stop and thank you for your comment on my post at Nesting Place. Did you also leave a comment on my blog? I just didn't get to those yet. I will soon. Either way, thanks! BLESSINGS...BEAUTIFUL QUILTS TO REMIND YOU HOW BLESSED OF THE LORD YOU ARE...CONGRATS...I HOPE YOUR DAY TURNS INTO WEEKS OF HAPPINESS AND JOY. I love Camille's style! So happy for you. Where are you going to put the quilt? Hey Jess...I'm trying to find a lovely place of honor for it! Wow! Wendy, you are one lucky girl!! It looks like Lissa did an amazing job. LOVE the back! So excited for you. I hope you enjoy it! Wendy, You are too Kind, Hope you enjoy the quilt.